Working in the prison system has afforded me a rare glimpse into the lives and consequences of antisocial behavior. It has allowed me to put into perspective the many blessings I often overlooked as a child. Things as simple as having a mother and father—whom, despite their differences, were nearly always present in my early life. I had a foundation that was a bit shaky but reliable nonetheless. It helped to form me into the man I am today, and for that I am thankful. I see firsthand how a damaged childhood can result in damaged adulthood. The cycle must be interrupted and early intervention seems to be the best course of action. The Department of Corrections (DOC) has many moving parts which we could spend an eternity trying to explain. That is not my intention here. I want to shed light on one division within DOC, as it has set forth to be a foundation for families to rely on and use to help rebuild difficult relationships. The department's Family Services Program coordinates with inmates and their families and help strengthen those relationships. One person in particular has gone above and beyond to create a once-a-year program that for many is also a once in a lifetime chance. Beatrice Giron, "Bea," is the lead organizer behind the Kids United by Incarceration Camp (KUBI), a camp designed to get children of incarcerated parents into the wilds of this great state, along with other children who are in similar situations. It's a chance to let their biggest secret be something that helps become their greatest bond. It is a chance to let them be free. Life is complicated for even the most organized and responsible adults. People who have had relatively easy lives can still get muddled and crazy from time to time. So what of those that have lived difficult lives? If we, as adults often struggle with the twists and turns of life, is it so difficult to imagine that those problems are compounded tenfold for children? The negativity and overall horror of some people's daily lives can be nearly unfathomable for most of us. Sadly, these homes often hold innocent children robbed of what most of us call normal life. They are the victims of the struggles of their parents and thus share in the burden of the grief that is caused. Life for them had been complicated to say the least. KUBI was created to offer children in these situations a break from problems that should not burden a child and to help strengthen the bond between child and parent. To start this process, Bea and her crew are very selective with both the children who attend camp and the staff who assist as counselors. This camp is a way for the parent to give something to their child, and so the relationship between them must already exist for this to happen. Finding incarcerated parents who want to help their children by giving them this experience is only half the battle. Bea also has to find a staff who is motivated to work with the challenges associated with children who may not have come from stable or healthy homes. The selection process Bea must complete is nothing short of amazing and much of this is done on her own time. She works tirelessly until the last hours before camp to make sure everything is in order. So why do a camp? The answer to that question is best addressed by asking a series of follow-up questions. What is it that draws us to the outdoors? What is it inside our souls that craves simplicity and pristine landscapes? Is it the healing power of the stress-free sights and smells of the wild? It stands to reason that in a world so often seen only through the hazy film of life's challenges and struggles that we would seek respite in the arms of something pure and genuine. A moment of clarity no matter how fleeting, can be a turning point and can set into motion a turn of events that may change a life. This is why we seek the wilds as they provide the perfect vessel to sail upon the purist river of self-discovery. We need to find ourselves and this all starts with having a place to look. KUBI camp is for many of these children the first time they can be honest about their situation. It is the first time they can feel free to interact with other children with no fear of being judged for their parent's decisions. The children in this camp are in many ways feeling a sense of freedom they've never known. In this setting, they're allowed to completely and wholly be themselves. Children arrive in waves and their uncertainty and shyness is very evident at first. For some, it only lasts a moment and they are soon making friends and running wild. For others, it can take most of the first day for them to open up. Each counselor is assigned a specific group of children and after the introductions are made, the first opportunity to bond comes in the form of lunch. The adjustment period is surprisingly short and the inquisitiveness of children is rampant throughout the dining hall. "When do we get to have fun?" they seem to always ask. Fun is soon to come but only after we all walk like a band of gypsies carrying sleeping bags and all other sorts of personal items to the cabins. Bed selection is always a great adventure with a top bunk shortage seeming to be the reoccurring theme. Soon after the cabins have been set up, staff and children alike gather in a circle at the beginning of camp and learn about what it means to be a "community" and part of a group. This is an exercise that is designed to show the children how much they have in common with the other people in group. Questions such as "Do you have a dog?" are asked and if the answer is yes you step forward. The questions ultimately culminate with the discovery that every child-- and even a few counselors in the circle-- has a parent in prison. The children are then shown all the staff are members of the many different sections of DOC. Staff then share what they do for the department and how that relates to the children's parents. For me, this is one of the most powerful moments of the camp. It is the time where a weight is lifted off the children and I can see them loosen up. They no longer have a secret that might bring ridicule and remorse. It is in this moment, they all become what they have always been… kids. This is also a moment for them to learn that we as DOC staff are not stealing away their mommy or daddy, and we are not bad people. I was crushed to hear one little boy ask "Are you the one who teaches our parents how to spank us or tie us up to chairs?" These are the struggles these children have had to deal with, and sadly, it is a life they will return to. This solidifies the absolute need to make this 3-day camp a positive experience for them. No matter what challenges that are sure to face them in the uncertain future, it is imperative to make this a positive memory for them to draw upon. It can often only take one person, one moment, or one happy memory to make a lasting and positive change in a child's life. KUBI camp is that opportunity. Days at camp are spent fishing, hiking, canoeing, swimming, archery, arts and crafts, rock wall climbing, and zip lining. They play dodgeball and kickball and often break out into random rock out sessions. The schedule is busy but flexible and allows the children to participate in the activities they choose. Nothing is forced and the only expectation is that they have fun! The day is only halted by the three meals served in a family style setting. Counselors and kids sit around tables and share conversation over hearty meals. I am always amazed at how well the children eat with little to no complaining about the menu or the clean up afterwards. Day transitions into night and the cabins come alive with dancing flashlight beams and ghost stories. The second night at camp brings a dance party, karaoke sing off, and marshmallow roast. Family Services provides a plethora of glow sticks and the whole camp enjoys a night of singing, dancing, and merriment in the highest degree. By this night the children all know each other and it is so great to see them interacting and trading phone numbers so they can stay in contact after camp. Laughter is the lullaby that lulls them all to sleep on their final night and it is a wonderful sound. Camp ends on the third day and it is bittersweet. A group meeting is held in which all the children are called up and informed of what their parent wanted them to get from participating in camp. They are then given a teddy bear made by the Sustainable Practices Lab at Washington State Penitentiary. It is a token, something tangible for them to remember this great time in their life. These kids have been given this fantastic opportunity to be themselves and have made friends they likely may never see again. The gravity of this begins to weigh on them and they fight hard to hold onto the last fleeting moments of camp. As the vans arrive the children have mixed emotions. Some cry, some are happy to be going home, and some seem almost lost not knowing what to say or do. In the three camps I have attended, one thing has been consistent with both staff and children alike and that is a feeling of thankfulness. It pours from the mouths of the children as they say farewell and it swells in the hearts of staff honored enough to be part of this uniquely rare experience of complete positivity. This camp is a light in the dark for every person involved. 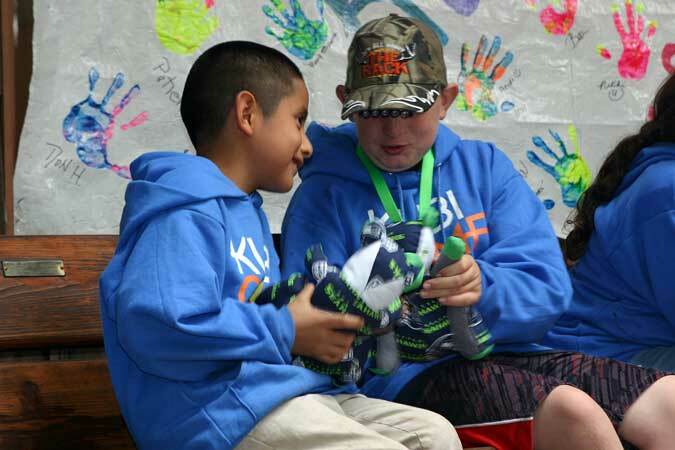 I have been absolutely blessed to have been selected as a counselor for KUBI in both Eastern and Western Washington. I recognize the need to help provide some positive influence in a child's life and my passion for the outdoors helps to fuel my desire to help these children by showing them how to have healthy fun in the great outdoors. In this place, we have a mix of so many great staff from all levels of the ranks. It is absolutely refreshing to see how well the staff get along in their combined effort to make this camp great. KUBI is the product of countless hours of difficult work by staff that truly care about what they are doing. It is a shining pillar of hope for these children and an opportunity that would be impossible without Bea, Family Services, administrative staff and the camp counselors. All have accepted the challenges this camp brings and have worked hard to make it incredibly successful year after year. I've taken the time to write this because it is my genuine hope that this helps others understand just how amazing this camp is and that Bea and her coworkers are recognized for doing such and amazing job. Most importantly I pray that my words have an impact which helps this camp enjoy continued backing and success for years to come.